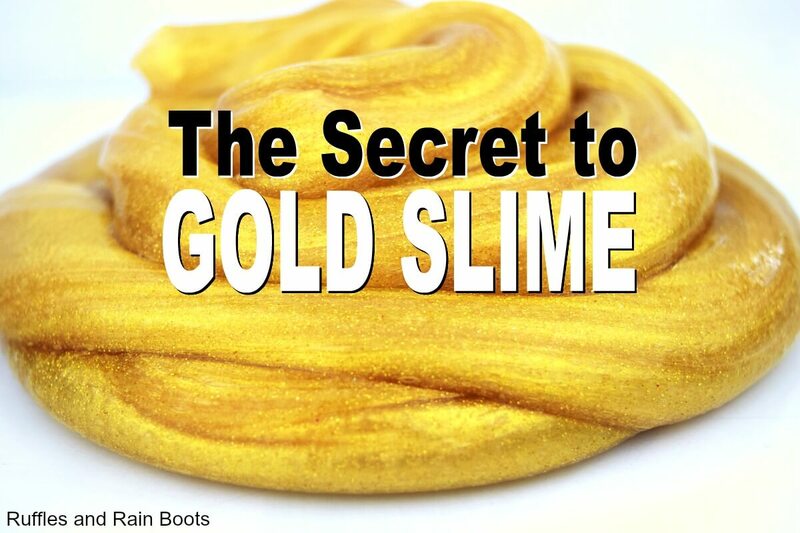 If you want a truly gold slime recipe, check out this easy recipe. It starts with a crystal clear slime base and is colored with glitter and powder to give it that WOW! effect. Wine and Slime Party – Because We Should Enjoy This Stuff, Too! But we’ve never been able to use white glue for bright, pearlized colors. The color never really popped, no matter the coloring or glitter we used. Thinking it was the recipe and activating agent we were using, I sought help. 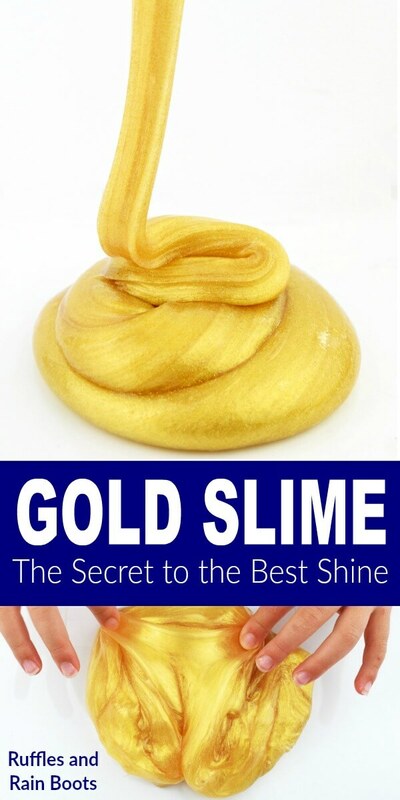 For this amazing gold slime, I used a professional’s slime recipe for clear slime. And it worked! That must be why she’s a PRO at making slime. And she’s a professional slime maker, friends. 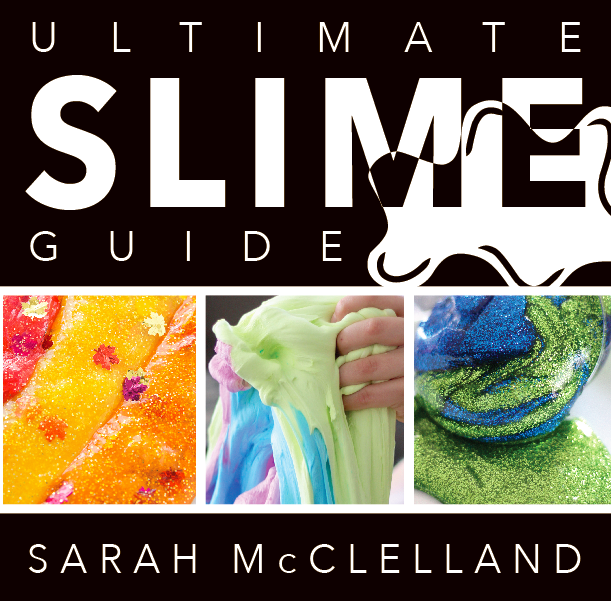 She’s even written a book, “Ultimate Slime Guide,” available on Amazon. We used half of the recipe. 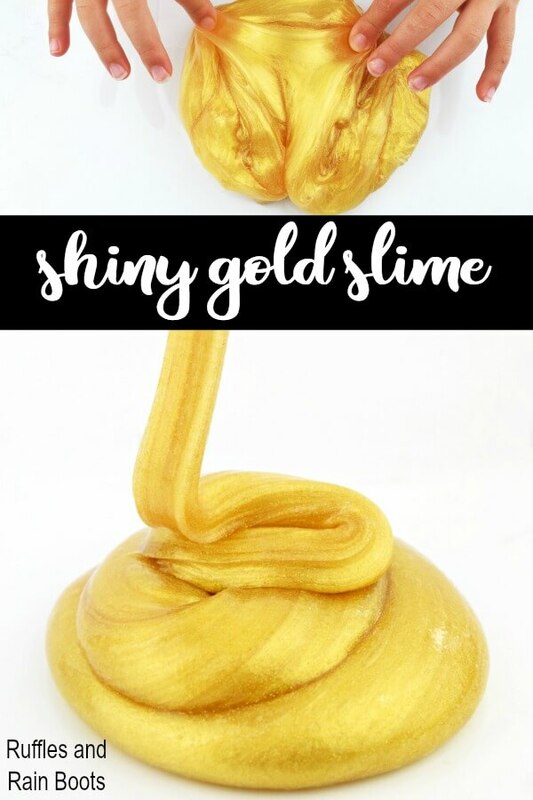 Be sure to click through for all the ingredients and measurements for the clear slime recipe here. It isn’t our recipe, so we don’t feel okay sharing it here. If you like to watch how to make slime video tutorials, we’ve included our popular video right here in this post – scroll up! Add the glue and water together. Stir until the glue is incorporated. Mix in the activator (start with 1 tablespoon and add incrementally) and stir. Go slowly until the mass forms. If needed, add a little more activating solution until the mass is fully formed after stirring. 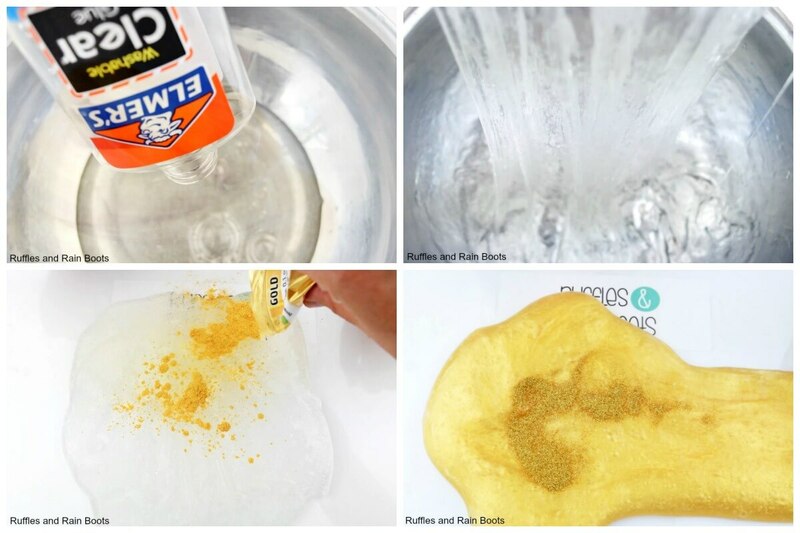 Stretch the slime slowly – see this article for tips about clear slime. Once it’s lost some of its stickiness, knead it by hand until no longer sticky. Lay the slime flat on a protected surface and add in sprinkles of mica powder. We didn’t measure, just layered it over the slime. We used about half a one-ounce bag. Slowly stretch the slime and fold in the mica powder. Add in glitter. We used about 3/4 of the 10g bottle. 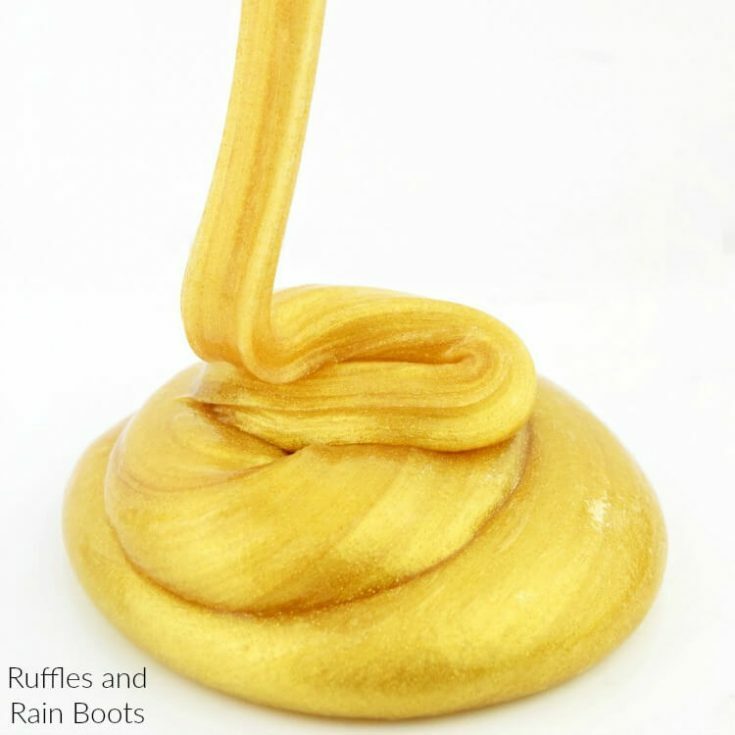 Stretch the slime slowly - see this article for tips about clear slime. Once it's lost some of its stickiness, knead it by hand until no longer sticky. Lay the slime flat on a protected surface and add in sprinkles of mica powder. We didn't measure, just layered it over the slime. We used about half a one-ounce bag. Slowly stretch the slime and fold in the mica powder. 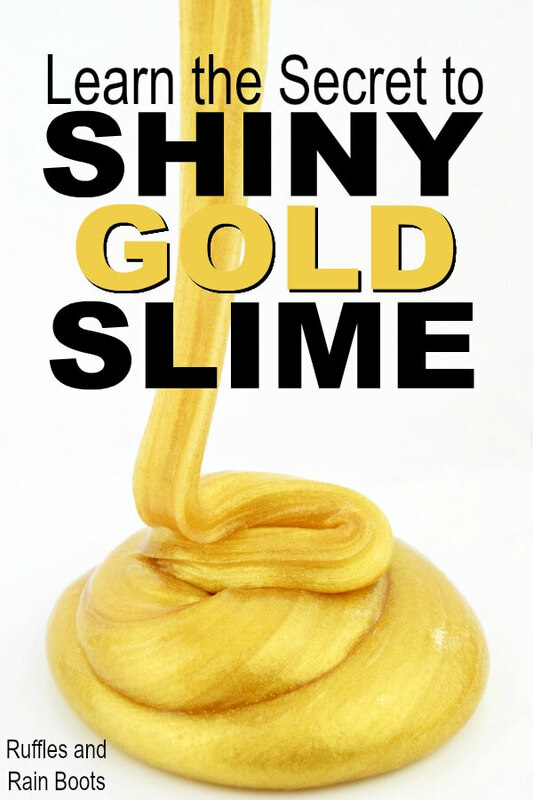 Who are you making this slime for? If it’s you, that’s a great start to getting a smile on your face. If you’re making this for a gift, be sure to gift it in an airtight container. And please share this!